What’s not to love about piles of soft, fluffy snow just waiting to be jumped into? Many dogs enjoy going for long walks in the dead of winter, even if their human companions are not too keen on it! Unfortunately, the season presents many risks to our furry companions. 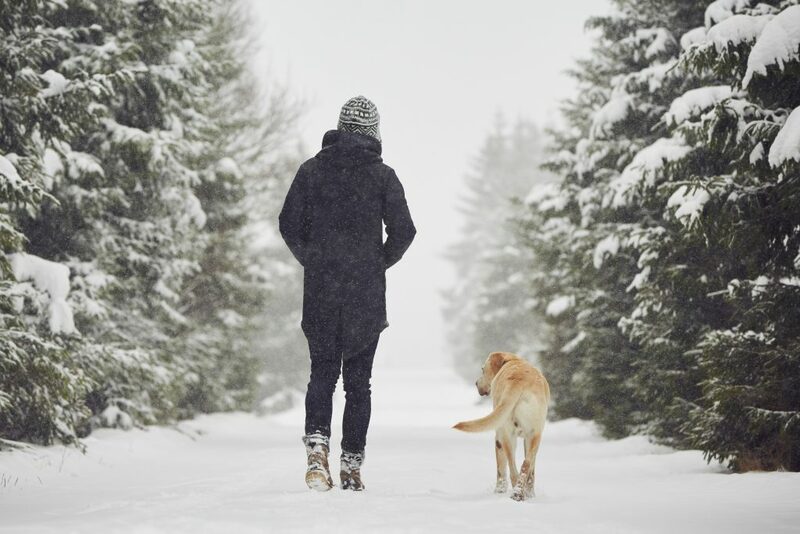 If you regularly take your dog for a long walk once each day, changing your routine to include multiple shorter walks would be preferable during the winter months to ensure your dog doesn’t suffer any harm from the cold. Although they may not show it, the cold affects them just as much as it does us; like humans, their paws need protection from the elements. Slippery ice patches, sharp ice shards and burning deicing salt all cause a threat to precious paws. If you’ve ever noticed your dog holding up a leg during a winter walk, or maybe they’ve suddenly dropped to the ground to frantically chew at a paw? This is likely caused by discomfort, or even pain, from de-icing salt or snow/ice buildup in between their toes. There are pet-safe de-icers available for purchase; sand and non-clumping kitty litter also make effective, and safe, de-icers around your home. However, harsh deicers are routinely used on public roadways and sidewalks, meaning you need other methods to protect those paws! There are many products on the market that are designed to protect paw pads from such hazards. Paw pad waxes create a barrier directly on the paw, but wear off over time and may need to be reapplied during longer walks. The best form of paw protection are dog booties; they will fully protect your dog’s’ feet from winter hazards, as well as keep them warm, clean and dry! Just a little bit of training and your dog will be a seasoned boot wearer in no time! Regular grooming is also important during the winter. Dogs with very furry paws need to have the hair between their toes trimmed routinely to keep the snow and ice buildup to a minimum. Washing your dog’s paws after each walk with lukewarm water and mild soap also eliminates the risk of toxicity that de-icing products pose when dogs groom/lick their paws.